I am an English and Creative Writing undergraduate with a chronic illness. Whilst those two things don't often work in harmony, I have managed to survive my time at university so far with the help of some simple steps. Naturally, everyone's experience is different and individual so, first and foremost, listen to your body. 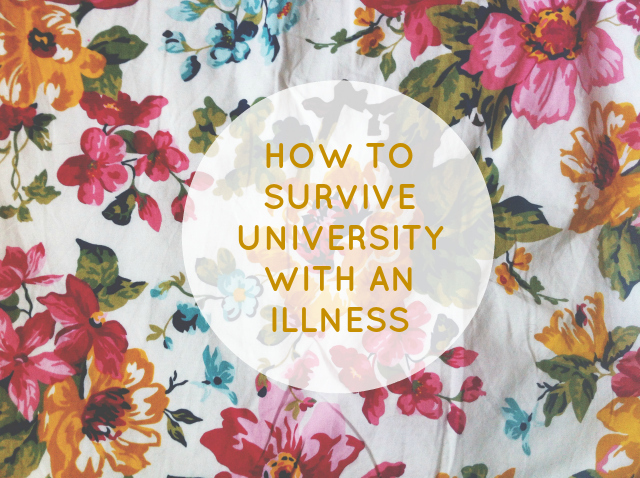 However these steps on how to survive university with an illness may just help you out. You don't have to do as others do. You don't have to drink excessively or go out all the time. If you want to, go for it. If you don't want to, don't. Don't feel as if you have to jeopardise your health and wellbeing to fit in with others. The ones that respect you and truly care are the ones who will understand wholeheartedly. I limit my nights out, try and get a good night's sleep, eat a balanced diet and drink soft drinks when I go out but that's just what works for me. The first thing to do once you've got your timetables is to email your seminar leaders and the head of your department to let them know a bit more about you. It can feel a bit embarrassing but it seriously makes a difference. My seminar leaders have been really respectful and understanding, making allowances for me and regularly checking in to check that I'm okay. Don't feel as if you're bothering them at all. It's their job! It's also a good idea to get in touch with disability support. They can give you lots of advice and they also offer services that will make your time at uni a lot easier. 4. Have fun and make the most of it! You take a billion tablets a day and your monthly check up at the hospital consists of a five minute conversation with your specialist about the regularity of your bowel movements, so what?! You can still get out there and have fun! If you're having a bad day, lock yourself away and have a weep but follow that up with a busy good day. Get outside, meet like minded people and never ever let anyone tell you that you're incapable of anything. Even if this has helped just one person, I'll have succeeded in my mission to soothe people's anxieties. That's more than enough for me. Don't ever feel like living with an illness means you can't reach your goals, you can go for it...just at a steadier pace! Furthermore, if an illness has meant you couldn't meet some of your prior goals, don't feel as if you're to blame, or as if you cannot eventually meet them. Take time out to look after yourself and then look into different pathways. hello and thank you for following me! i've just read this post and found myself nodding vigorously throughout. i'm sorry to hear of your illness, but am glad you're fighting against it to make sure you have as good a time as anyone else. i understand how you're feeling - whilst it's not as serious i was suffering with a severe wheat/gluten intolerance for years and was only diagnosed a few months ago. i finally feel like i can get on with my life and start making the most of things now that i have a better idea of how to make the best of myself and how to adapt my lifestyle. i'm now trying to live through the pains and aches that come from damaging my intestines unknowingly and have finally regained the confidence to get back out in to the world and do things! also, as a fellow english student i definitely understand the piles of books creeping their way in to pictures.. my room is covered! I adored reading through your blog (: Ah, that can be horrific when it's gone undiagnosed! I think it's so unbelievably terrible that doctors are so reluctant to take stomach pain seriously. It's been so damaging to so many people!! Ah, I didn't know you studied English too! I had to buy a specific university book case just to house them all! I loved reading your post. I had to go to hospital to have tests for Crohns but it turned out to be IBS but I can completely relate to what your saying. It seems as if illnesses like that can't be openly talked about too, I get so embarrassed sometimes about having to go to the toilet a lot and can't cope with stress well either. This is such an inspirational post. It sounds like you've reached a very positive place. I'm glad you managed to get yourself back on your feet after taking some time to rest and regroup. I hope your readers consider the advice you've given because you're absolutely right. I wish I had been less self critical with my illness, which is also a long term one I've had since I was nine. I hid the extent of it until I was seventeen. Then I kept everything a secret and always pushed myself to ridiculous extents at uni but by the time I'd reached my third year, I crashed and so very hard. I had to tell my lecturers what was going on and I think if I hadn't I would have failed. Similar to your experience, they were very helpful and understanding. As it stands, I don't even know or understand how I managed to get along rather well and still enjoy my uni experience. You're right in saying that people with a health condition need to understand it and most importantly know how their body reacts to it, and be careful about what they do or don't do. I won't lie, I still don't feel comfortable discussing my health with anyone. I don't know you but I feel so glad that you were given the right care and that you seem brave enough not to be afraid to speak out. It took twelve years for my doctors to find the right medication for me and that was three years after fully diagnosing me and giving me things that worsened it. Anyway, sorry to ramble. Once again, I think you come across as a very positive person and evidently you are very brave and it's a great example. People need to know that a health condition can alter your life but it doesn't have to permanently affect your quality of life. P.s. I love The Castle of Otranto! Are you an English Literature or Creative Writing student? Thanks so much for taking the time to leave this comment. It meant a lot to me. Mm, I wasn't given the right care at first. I now have a medium case of my illness because they misdiagnosed it ;/ I'm sorry to hear that they took so long to give you your diagnosis, sweet. Haha, I love that book too! I'm currently just an 'English' student but that involves both creative writing and literature! Brilliant post hun, I'm sure this is going to many of your readers...those with similar illnesses to yours and the many other illnesses out there that can hold people back from living their lives! Very inspirational and you should be so proud of all you have achieved. Thank you! I do feel proud, as silly as that is to say! Thank you so much, sweetpea. Thank you for linking it in your amazing post too! EVERYONE WITH ILLNESSES: LISTEN TO BEE. This is such a great post, Bee. It's so nice to know someone is out there and gets it! I have somatization disorder which is super fun, naaat, and also not very treatable, so it's a 'management' kind of disorder. I also took a year out to do something different and get treatment under way before going to uni - I'm so glad I did this as I would never have coped if I'd accepted my place. It's difficult at university to explain to people that I can go out sometimes, but mainly I want to stay in bed because I'm exhausted, or that yes, I do need the ridiculous amount of sleep I make sure I get. People are all about going out (and spending a lot of money! eurgh) and drinking etc, but I can only cope with this every so often. Luckily, I've found a couple of friends who like staying in and watching cool stuff and making things, so I get some fun in too, even when I have to stay in. Sometimes when I'm feeling bad about things, it helps to remind myself of all the things that I DO manage to do, compared to some people who have my condition, and to try and be grateful for that. Focusing on the positive sounds really stupidly obvious but everyone forgets now and again! Your point about telling the advisors at university is SO important. I didn't for a while, and then when I found myself unable to go to lectures (and getting a warning!) I realised that it's actually beneficial to go, and they aren't so scary. And ew, just spotted Robinson Crusoe. Damn I hate that book right now. Baaaaaaaaaaaah, I love you. Thanks so much for leaving this comment! Much appreciated. Haha, Robinson Crusoe is shite. I'm glad you've found some friends who are like minded (: Hope you manage to keep your illness under control for the foreseeable future and continue to be as awesome as you are! To be completely honest with you, I think you're inspirational. This is the first time I've visited your blog (link from daisybutter) and this is the first post I've read, but I think it's great advice to people with or without a long term illness. I'm now going to work my way through the rest of your blog and have a good read ha! p.s. good luck with Castle of Otranto, I attempted it in Sixth Form and read maybe 3 pages. Oh wow, thank you so so much for your kind words. They honestly mean the world to me!! Hope you like my blog. Oh, I loved Castle of Otranto! I got pretty sick quite towards the end of my time at high school, and this advice is pretty much perfect. Luckily for me it wasn't a long long-term kind of thing, but I was definitely down and out for several months, not to mention the time it took to get back to normality once I had recovered. It's really nice to read a post from someone whose uni experience wasn't centred around clubs and drinking. I have a blood condition that means I take daily tablets and have blood tests every fortnight and I can appreciate how infuriating it is when sometimes you just want to go out and be like everyone else. Thank you very much! Ah, how I love blood tests. I completely agree with you. I've definitely changed in many ways. Oh Bee, Damn YOU! I am wedged up on the sofa today, with my duvet, half a ton of books and my laptop trying to revise for my exams because I could barely get out of bed today, and I wish I had known every damn thing you've put in this post 18 months ago. All of this is so true, living with an illness- even if it's not quite as long term as a disease like Crohn's, is so applicable, and key for me has been understanding that I have to look after myself as a priority- eating when I know I need to and making the most of good days, but that doesn't mean I have to be isolated, without friends or unable to have the kind of fun that I'm interested. You're a frickin inspiration to us all Bee, keep it up, super proud to see your progress in the last 12 months. Thank you so much, sweet! This comment really made me feel unbelievably happy. You've written such a well thought, great post here. Whilst it orientates around yourself and your illness, I think the majority of advice you're written here can be used by all university students, with illnesses or not. I don't have an illness, but I tick all of the boxes in your advice list. Whilst it can be fun getting absolutely blathered, I enjoy my steady drinks and being able to remember what I do. But well done to yourself for your determination and dedication to excel in your education, whilst also controlling your illness! This is such a good post! I really struggled at university, and a massive mistake I made was not telling my tutors about my disabilities. I felt like I could do it on my own and just like you said, didn't want anyone to feel like I was using it as an excuse. Well I failed my second year and if I'd have had the support I'd needed I think it would have been a very different story! Sounds like you're doing everything amazingly, especially with the food thing. It's so difficult to eat enough on such a small budget! Really nice to see someone blogging about something as important as this, I suffer with migraines, and wish I listened to my body in my first year but thankfully I seem to have reached a better point in that journey, so true about accepting the bad days and making use of the good! Really inspirational and sort of a relief that other people my age have disabilities and are attempting to cope with them too. Great advice. With over 20 years experience myself with Ulcerative Colitis I know exactly where you are coming from. I wish you the very very best with your education.